For the Symbiosis Eclipse Gathering Monarch Beverage Catering created The Glitter Ranch experience. This massive bar installation featured a custom “old west meets disco” design theme, which was a major hit at the festival. Over 30,000 patrons were served throughout the event by our costumed bar team. PayPal hosted an exclusive 900 person private after party for the Outside Lands music festival featuring major artists Chromeo and Holy Ghost. Monarch Beverage Catering kept the party going all night with our high volume craft cocktail bar experience. 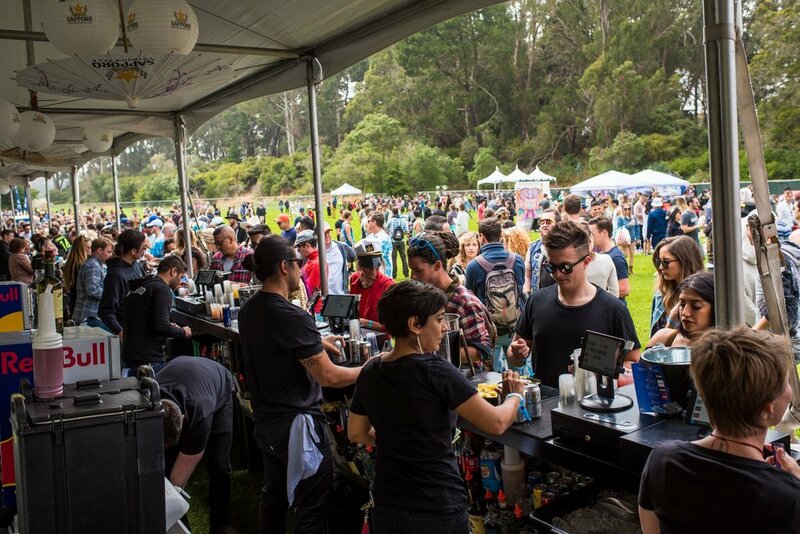 Monarch created a high efficiency bar experience for over 6,000 people with incredible craft cocktails for this music festival in Golden Gate Park. 5000 people served per day. Monarch has worked closely with the Dirtybird team to create a distinct menu of craft cocktails and specialty beers for each of these 5,000 person events. Monarch worked closely with world-renowned catering company Paula Le Duc to deliver an amazing cocktail and high-end wine service for this opulent event. Event cocktail hour and morning bloody mary bar. Worked with Preservation and Co. to make to make an build you own bloody marry bar featuring a spread of locally picked vegetables.